TIP: Easy Pavé Floral Arrangements — Sweetchic Events, Inc.
One good thing about meeting with clients at home is that I have a perfectly valid excuse to buy fresh flowers (as a business expense, ha)! I always run to Whole Foods and buy whatever flowers happen to be on sale. 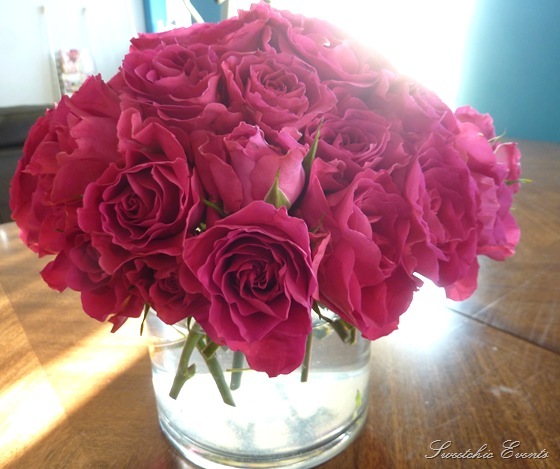 This week I grabbed one bunch of fuchsia spray roses which I cut down and arranged Pavé style in a small, 5 inch glass cylinder. Fresh flowers at home always makes me SO happy; such an easy pick-me-up! The easiest thing to do for your holiday entertaining is to grab one or two bunches of a SINGLE type of flower, trim them down and arrange them in a shallow vase. DON’T buy the pre-made bouquet of assorted flowers… they are more expensive and have alot of unnecessary “filler”. Try using one type of flower in varying shades. Carefully clean stems so they are free of greens and foliage, leaving only the blossoms and stems. Flowers should be cut so that the blooms fall just above the neck of the vase. Work from the outside in — start by setting flowers in a ring around the edge of the vase and work row-by-row toward the middle. You will be begin to create concentric circles and the stems will form a “grid” in the vase. With each successive layer of flowers, you will have more structure with the stems and you can use this structure to support the next layer. Keep a “dome shape” in your mind’s eye and work to make the inner layers of flowers stand slightly taller than the outer layers. Don’t be afraid of the flowers jutting out at an angle; with each new layer, they will stand a bit straighter and taller. By the time you reach the middle, you should have a firm network of stems to support the taller flowers and they will stand straight up!